Unique artist studio in 19th century building in the city center. Immerse yourself in Nassau’s art, history and culture! The loft is located in a secluded courtyard space. This 200+ year old building was the annex of the main house that once sat on the front of this property. 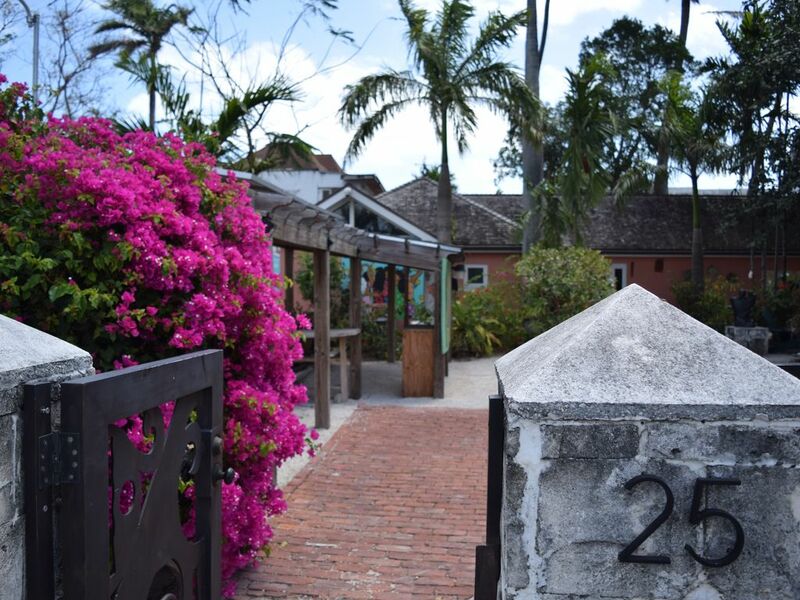 This annex served as the kitchen for the main house and still has original fireplace where food was prepared.The annex has been restored and repurposed as an art gallery and studio space by internationally renowned Bahamian artist, Antonius Roberts. It serves as a community art space where creative people gather. Hillside House is very serene and peaceful even though it is in the midst of the hustle and bustle of downtown. The exposed limestone walls and paint splattered concrete floors add to the studio’s charming character. All year round the weather is beautiful and you can take the easel out and paint in the romantic courtyard filled with local orchids. The studio space is filled with our favorite odds, ends and a healthy collection of art books. The studio walls are also adorned with original artwork by Bahamian artists. You are always welcome to pop next door and view the gallery’s current exhibition. Come and be inspired by the island! There are two double beds in the loft space. The studio has it's own bathroom with a spacious shower. The kitchenette contains a mini fridge, coffee/tea maker and convection microwave. All cooking dishes/utensils provided. A perfect and atypical place downtown: a real piece of Nassau ! If you wish to escape the massive tourism , if you like to be on your own with a nicely decorated spot, if you want to discover the tiny downtown from an unusual perspective, then come here ! And Selena is extremely sweet and welcoming . I really enjoyed being here , thank you Selena ! My favorite stay EVER! So much character and the best atmosphere! If you're looking to book this space, erase all hesitation! This studio is incredible. It is immediately inviting. The courtyard is gorgeous and lit with beautiful lighting all night so it always feels safe and secure. I truly felt more at home in this place than I do in my own apartment in Eleuthera. The beds are low to the ground yet very comfortable! I slept well all three nights. This place has everything you could ever want! For coffee lovers, there is a Keurig with numerous flavors to choose from. If you're not into the Keurig, there is a Starbucks about 1 minute away. There is a bluetooth speaker that allowed me to get my jam on while getting ready and an iron with an ironing board which is essential when doing business travel. There is a full selection of nice dishware, a smart oven, and a small refrigerator. Storing leftovers and heating them up was a breeze! There are even two umbrellas for rainy days and essential travel amenities such as toothbrushes and paste, body wash, shampoo, and conditioner! The host, Selena, has truly thought of everything! She has even created a travel guide (in a binder) that I often flipped through in the evening to see what I should hit up before flying out. This place is super close to downtown and all it has to offer. I highly recommend Athena Cafe (Greek) and Taj Mahal (Indian). Taj Mahal is definitely on the pricey side, but the food is incredible! It's about a 5-minute walk from the studio. I needed a cab several times, and it was very easy to hail one at the Hilton (about 1 minute away). There is a car rental place across the street which also makes renting a vehicle incredibly convenient! I could keep going on and on about this place. I LOVED my stay and truly do not want to leave. Don't hesitate! Book this gem today! What a lovely little gem!!! If I come back to Nassau there is no place I'd rather be! Selena was more than a super host...so welcoming and accommodating. Thank you Selena!